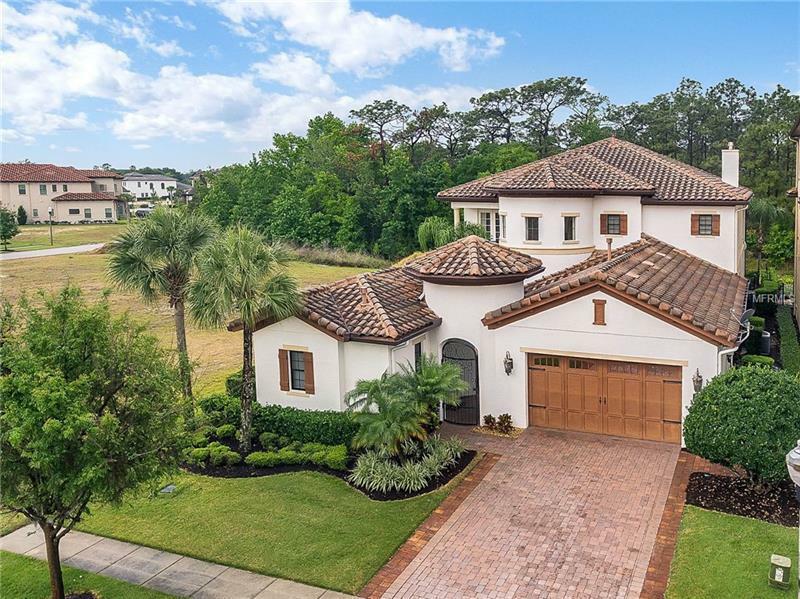 Stunning Mediterranean inspired Estate Home located in highly desirable Reunion Resort. This home is nearly 6000 square feet and includes something for the whole family. Whether you are looking for your dream home or a fantastic vacation rental this home has it all! There is a detached in-law suite located in the front of the property allowing house guest to enjoy space of their own. As you pass the in-law suite you will enter into a tranquil courtyard leading you to the entrance to the main house. After stepping under a spectacular hand detailed archway you will immediately be drawn to the homeâs high- end finishes and upgrades. On the first floor you will find an oversized kitchen area with island a formal dining room with butlerâs pantry and a main living room area with high vaulted ceilings and gorgeous gas fireplace with beautiful custom chimney. Also located on the first floor are two guest bedrooms a state of the art movie theatre and master bedroom suite which leads out to the screened in rear pool deck. Once outside enjoy the scenic and secluded patio which includes an outdoor summer kitchen and fireplace. Upstairs you will find two additional guest rooms with attached bathroom and an oversized kidâs room; with custom built-in bunk beds and large play area. A rear balcony overlooks the rear wooded area and pool. Reunion Resort is close to all major theme park and Only 6 MILES away from Walt Disney World. Reunion is also home to 3 Championship Signature Golf Courses.